The vermilion flycatcher is a very popular passerine with birders but unfortunately there are very few places that you can find them in the United States. There are actually twelve different subspecies of vermilion flycatchers and that can be found from the south western United States down though Mexico, Central America and most of South America. 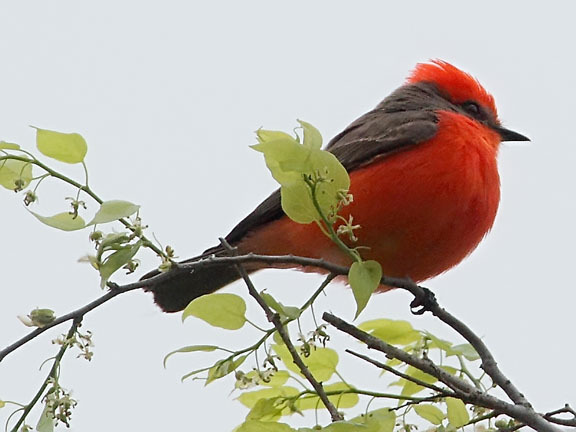 The photo above is of a male vermilion flycatcher that I photographed in south Texas in 2010. As with many passerines the female of the species is much less colorful. The only red on the female is under the tail and it is much paler then the red on the male. Excellent photograph of a beautiful bird. What a divine shot of this stunning bird. Just beautiful! I've only seen one once, at the King's Ranch in Kingsville, TX. Awesome photo as usual! Wow! Enough to make me want to become a birder! Great photo. I think we all are attracted to the beautiful birds of prey.